Graveside services for former Seminole County resident Eva Viola (Atchison) Hunter, 86, are scheduled for 1 p.m. Thursday at Little Cemetery. Funeral arrangements are under the direction of Swearingen Funeral Home. Hunter died Tuesday, Jan. 19, 1999 in Holdenville. She was born Dec. 27, 1912 in Porter, Texas to Lexus Paris and Mary Jane (Weber) Atchison. Hunter worked as an LPN in California for several hears before moving back to Oklahoma in 1982. She was a member of Women of the Moose and VFW while living in California, and Eagles in Wetumka, where she served as Chaplain in the past. She married Lester W. Hunter on Sept. 11, 1929 in Seminole. He preceded her in death July 13, 1990. Hunter was also preceded in death by her parents; one son, Alvin Hunter in 1986; two daughters, Almeda Hunter in 1932 and Sharon Devor in 1980; and several brothers and sisters. Survivors are three sons, Dale Hunter, Mission, Texas, Martin Hunter, Holdenville, and Darrell Hunter, Merced, Calif.; one daughter, Nina Murphy, Park Hill; one sister, Bertha Carroll, Tulsa; 18 grandchildren and many great- and great-great-grandchildren. Bertha �Birdie� Orlena (Atchison) Carroll, a former Seminole resident, died Monday, April 22, 2001 in Tulsa at the age of 99. Funeral services are scheduled for 10 a.m. tomorrow at Moore Memory Chapel of Tulsa. Graveside rites are to be at 2 p.m. at Little Cemetery. She was born Oct. 23, 1901 in Mountain Home, Ark. to Lexis and Mary Jane Atchison. Bertha was preceded in death by per parents, her husband, Fritz Carroll, and a total of eight broth- ers and sisters. She had no children, but many nieces and nephews. Funeral services for longtime Seminole resident Alfred �Hix� Webber are scheduled for 1:30 p.m. Tuesday at the Swearingen Funeral Home Chapel. Rev. Mack Peercy will officiate the services. Burial will follow at the Rest Haven Memorial Gardens under the direction of Swearingen Funeral Home. Webber died Friday, Jan. 18, 2002 at his residence at the age of 88. He was born to William Lee Webber and Annie (Tripp) Webber on July 13, 1913 at Mt. Home, Ark. 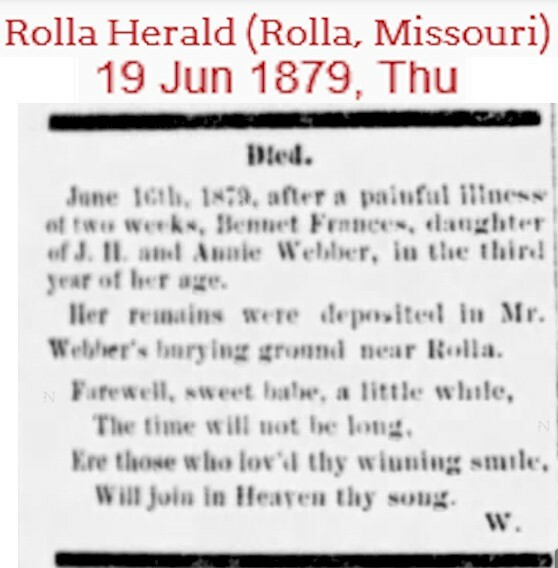 Webber married Deo Bell (Small) Webber on March 15, 1941 in Perryville, Mo. Early in his life, Webber worked in the oilfield as a cable tool driller. Later, Webber owned and operated Hix�s Trading Post in Seminole since 1965. He was of Baptist faith and a member of the Oddfellows Lodge. Webber was preceded in death by his parents; his wife, Deo Bell Webber on May 2, 1988; two sisters; and one brother. He is survived by three sons, A.E. �Doc� Webber and Jack Webber, both of Seminole, and Tom Webber, Tulsa; two daughters, Ann McClard, Tampa, Fla., and Carol Otterman, Liberty, Mo. ; one sister, Jean Maines, Seminole; 16 grandchildren and 13 great-grandchildren. Casket bearers are Matt Webber, Chris Webber, Scott Robertson, Jeremy Otterman, David McClard and Brian McClard. Honorary bearers are Clifford Beichner, Calvin Maines, Jim Moreau, Ed Herber, H.H. Harper, Jim Hallum and Ronnie Plank. Funeral services for Seminole resident, Delphia Orlena "Jean" Maines is scheduled for 10:30 a.m. Tuesday, Feb. 10 at the Swearingen Funeral Chapel with Mack Peercy officiating. Interment will follow at Rest Haven Memorial Gardens in Seminole under the direction of Swearingen Funeral Home. Maines died Friday, Feb. 6, 2004, at the age of 82 at her home in Seminole. She was born Jan. 14, 1922, in Mountain Home, Ark. to William Lee Webber and Annie (Tripp) Webber. She married A.C. Maines on Oct. 8, 1965 in Seminole. She moved to Seminole in 1976 from Earlimart, Calif.
She was a beauty operator, retiring in 1976. She was a member of Calvary Missionary Baptist Church in Tecumseh. She was preceded in death by her parents; and her husband, William Webber on June 30, 2003. She is survived by four sons, Bill Howard of Elko, Nev., Mike Howard of Tyler, Texas, Jerry Maines of Lancaster, Calif. and Dan Maines of Phenix City, Ala.; two daughters, Barbara Thomas of Farmington, N.M. and Katy Shephard of Pixley, Calif.; 11 grandchildren and six great grandchildren. Graveside services for Esther V. Atchison, 96, of College Station are set for 11 a.m. Thursday at Brookside Cemetery in Houston. Dyrel W. Collins will officiate. Visitation will be from 5 to 7 p.m. Wednesday at Callaway-Jones Funeral Home in Bryan. Mrs. Atchison died Monday at Sheridan on Rock Prairie. She was born in Kennison, Okla., and lived in College Station since 1969, moving from Houston. She was a tribal member of the Cherokee Nation with her lineage going back to Amatoya Moytoy, Supreme Chief of the Cherokee. She attended Rogers Indian School and was a member of A&M Church of Christ. She was preceded in death by her husband, Burl Lonnie Atchison; and a daughter, Norma Lee Atchison. Survivors include four sons and daughters-in-law, Lexas and Jo Atchison of Grand Prairie and Jimmie and Gertrude Atchison, Lonnie and Virginia Atchison and Herman and Wanda Atchison, all of Houston; three daughters and two sons-in-law, Carmeletta and Dyrel Collins of South Bend, Evelyn Cooper of Bryan and Glenda and Tom Chaney of College Station; 22 grandchildren; 44 great-grandchildren; and five great-great-grandchildren. Edgar Thomas Bolding, 83, of Mountain Home found eternal rest on Oct. 13, 2005, in his home. He was born Nov. 5, 1921, at Cartney to Marion E. Bolding and Maudie E. (Lane) Bolding. After receiving his schooling at Flat Rock School, he received training at a CCC camp in the Leatherwood Mountain area and enlisted in the Army in 1942. He was a member of the 112th Infantry Division and marched through a liberated Paris and participated in the Normandy invasion. While entering the Siegfried Line in Germany on Sept. 19, 1944, he was wounded by German fire, for which he received the Purple Heart He also received a Bronze Star. During his recuperation, he met and married Irene S. Webber, of Mountain Home, on July 12, 1945. Edgar was a lineman for City Utilities in Springfield, Mo., and later worked for PAR Electric in Kansas City supervising installation of high power lines for the state of Missouri. He retired to Baxter County and became active in starting the Clarkridge Volunteer Fire Department, of which he was assistant fire chief. He wore several hats, one of which was Honorary Mayor of Clarkridge Community and received a Castle Award from the Corps of Engineers as well as a proclamation naming him the ?Blue Bird? man for his participation in the bluebird house program at Pigeon Creek Recreational Area. He was an active member of the Highway 5 South Church of Christ. He is survived by his wife of 60 years, Irene; children Lonnie (Marilyn) Ables, daughter Linda (Joe) Mooney, all of Rogersville, Mo., son Lamar (Patricia) Bolding of Strafford, Mo., and daughter Lynette (Richard) Jennings of Nixa, Mo. ; 12 grandchildren; 10 great-grandchildren; one brother, Mildred, and wife Vida Mae of Little Rock and many nieces and nephews and a host of friends. He was preceded in death by his parents, three sisters, six brothers and one grandchild. He will be greatly missed by all who knew him. A funeral will be 2 p.m. today in the Roller Funeral Home Chapel, with visitation from 9-11 a.m. Burial will follow in Baxter Memorial Gardens. Memorials may be made to Clarkridge Volunteer Fire Department. A chapel service for Helen Trivitt, 85, of Mountain Home, will be 2 p.m. Saturday at Kirby & Family Funeral Chapel with the Rev. Tim Turner officiating. Visitation will be from 1 p.m. until service time. Mrs. Trivitt died Wednesday, May 23, 2007, at Mountain Home. Helen was born Jan. 16, 1922, at Mountain Home to Lonnie and Mary Lou Carter Webber. She married Willie Trivitt in 1944. She retired from Zenith Manufacturing in 1984 after a lifetime of working to support her family. 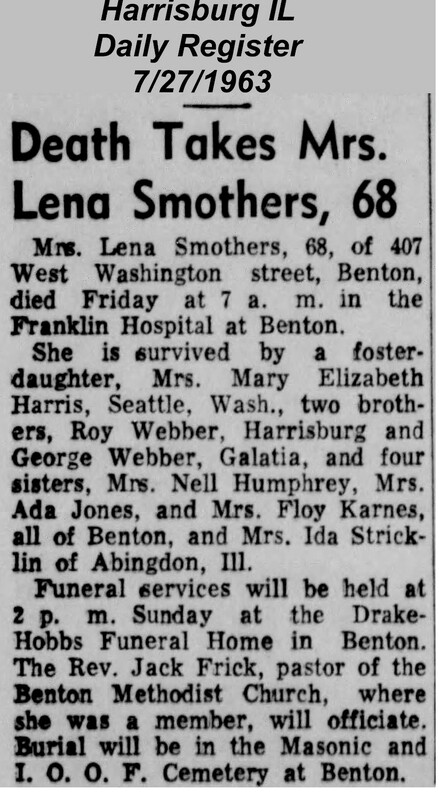 Helen is survived by four daughters, Marviene (Paul) Decker of Mountain Home, Joe Ann (Allen) Epperson and Janice (Larry) Fellin, all of Springfield, Mo., and Judy Trivitt of Ash Flat; one son, Bill (Vicki) of Springfield; four sisters, Aldean Ore, Edith Thompson, Irene Bolding and Edna Marshall, all of Mountain Home; 19 grandchildren; 30 great-grandchildren; and nine great-great-grandchildren. She was preceded in death by her husband; her parents; her loving daughter, Nadiene Peters; and three sisters. Burial will be at Quality Ridge Cemetery with Bill Trivitt, Chris Trivitt, Brian Trivitt, Keith Trivitt, Eric Lamanna and Marc Lamanna as pallbearers. Honorary pallbearers will be Adam Stokes, Jordan Stokes, Rickie Martin, Kevin Decker and Darin Fellin. Arrangements are by Kirby & Family Funeral Home. Tom C. Webber, 98, of Rogers, Ark., died Tuesday, Sept. 12, 2006, in Rogers. He was born Dec. 6, 1907, in Salem, Ark., to Henry Webber and Ada Deathage Webber. He was a member of the First Baptist Church in Rogers and the Rogers Historical Society. He was a World War II veteran. Survivors include a sister, Marjorie Bahr of Windsor, Mo. ; and a nephew, James Holland of Independence, Kan.
Funeral services will be at 10 a. m. Thursday, Sept. 14, at Rollins Funeral Home of Rogers with the Rev. William Isbell. Burial will be at the Midland Memorial Gardens Cemetery in Union, Mo. Services for former Seminole resident Ray Webber are scheduled for 11 a.m. Thursday at First Baptist Church in Lindsay. Revs. Randy Allen and Aaron Lokey are scheduled to officiate. Interment will be at the Little Cemetery. Funeral services are under the direction of B.G. Boydston Funeral Home. Webber died Monday, Oct. 4, 2004, at Norman Regional Hospital. He was 83. Webber was born May 13, 1921, in Stonebluff to Ed and Stella Webber. 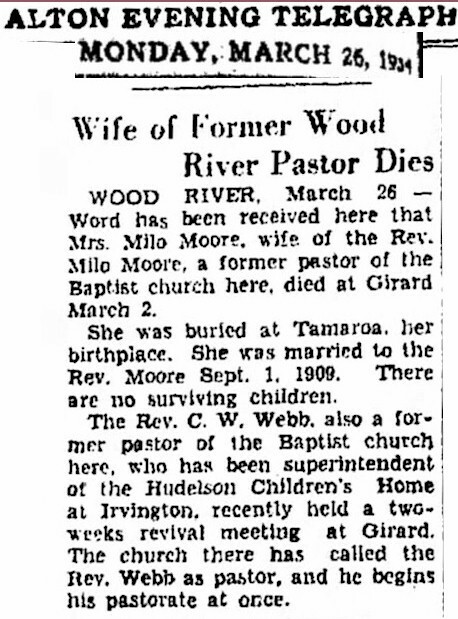 Webber married Violet Warrington on Sept. 18, 1941. From 1943-45, Webber served his country in Europe with Company 1, 275th Infantry Regiment 70th Division. He worked in the oil field industry and retired from ARCO in 1982. He was an active member of the First Baptist Church in Lindsay where he served as a deacon. Webber way preceded in death by his parents; his twin sister, Fay Elrich; sister, Lena Mae Long; and brother, Edward Webber. He is survived by his wife, Violet; one sister, Juanita Vandergriff; one son, Tom of Kalamazoo, Mich.
Memorial contributions may be made to the Children�s Baptist Home by contacting the office at the First Baptist Church, Lindsay. People look at tombstones and see only the beginning and the end of a life. What happens in the dash of ones life? The significance of ones life are the years between the beginning and the end, the dash. I had the privilege of knowing Faye Elrich for the last 34 years of my life. She is someone that will never be measured by great deeds but by the little things she did over her lifetime. I have traveled to over 65 different countries and have fought in three different wars but have failed to live up to the lifes work of my mother. During my career I always had one advantage over the other guy. At every moment of fear I knew that my mother would be there praying for my protection and to give me the courage to perform my job of leading of soldiers. Faye Elrich was born on May 13, 1921 to Edward and Stella Webber of Stonebluff, Oklahoma. Faye did not get most of the opportunities that we share today. She was reared during the Depression and spent her early adult years working to assist her family as her brothers fought during World War II. Fayes early years are difficult to measure by any worldly means. She chose to serve the greater good by working as a nurse serving those who could not care for themselves. She excelled as a nurse winning friends in her peers and personnel under her care at Kern Medical Hospital in Bakersfield. Faye married Harvey Elrich on June 11, 1954. She was a wonderful wife and mother. They enjoyed 47 years of marriage and friendship. The last two years of marriage she represented what is most important in a spouse by remarkable care of Harvey through the two years in the Veterans Hospital in Los Angeles. She traveled as often as possible to ensure his well being and treatment. Faye departed this world, well prepared for her arrival in Heaven and joined her own parents and Harvey on September 20, 2004. I am comforted that she departed this world in console of Christian hymns and a Pentecostal pastor praying for her comforted departure of this world. Faye will not be remembered for her material possessions when she departed this earth. She will be remembered for her small donations to the youth group ministries and for helping to feed the children of this world. Her charity of Gods work and to her fellow man is comparable to the widow that had but only a mite to give to God. I am comforted that tonight she sleeps in a mansion for remembering what is most important in life. Faye lived a life envied by many but replicated by few. I thank my father and mother for adopting me later in life and giving me the opportunity to grow. They gave up their golden years providing for me. The number one thing I thank them for is teaching me about God and how to be a man. She departed this world to the loving arms of God on September 20, 2004. 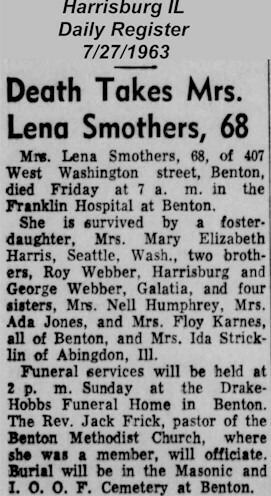 She was a loving sister to Edward, Ray, Lena Mae and Juanita Webber; mother to John Elrich; wife to Harvey Elrich. Today she is in a far better place and in the arms of those who love and care for her. Graveside services for Joseph Homer (Pat) Limerick, 79, of 318 Breezeway, will be held at 10 a.m. tomorrow in Seaside Memorial Park with the Rev. John Ryan officiating. Arrangements are under the direction of Maxwell P. Dunne Funeral Home. Limerick died at 12:30 p.m. yesterday in a local hospital after a long illness. A native of Raleigh, Ill, he was educated in St. Charles, Mo. He owned and operated grocery stores in southern Illinois before moving to Corpus Christi in 1937. He established Limerick Food Market at Six Points in 1937 and operated the store until his retirements in 1958. Surviving are his wife, Millie; three sons, Joe H., George W. and John G. Limerick, all of Corpus Christi; his sister, Mrs. Geneva Burton of Hialeah, Fla.; his brother Gil L. Limerick of Corpus Christi; eight grandchildren, and two great-grandchildren. In lieu of flowers, the family requests that friends make contributions to charities of their choice. William G Mitchell, 46, judge of West Frankfort City Court, and a familiar figure in local public affairs for many years, was dead today as a result of an automobile accident near Belleville, early Sunday morning, in which Dr. Frederick Halsey, 59, East St Louis veterinarian, was also killed. Judge Mitchell's death was caused by a broken neck. His body was jurled 25 feet from the car. In the car with Judge Mitchell were Kenneth Robinson, 25, mining official from Colp, and Miss Florence Summers 27, and her sister, Opal, 25. Although the passengers were badly injured, physicians said today all would recover. Judge Mitchell came here from Eldorado where his parents, Mr and Mrs Thomas C Mitchell, still reside. Ruby Lea Boatman Harrison, 65, of Rogers, Arkansas, went home to be with her Lord on December 9, 2007, in St. John's Regional Health Center in Springfield, Missouri. She was born on September 30, 1942, in Pleasant Hope, Missouri, to the late Sam Boatman and Opal Greathouse Boatman. She was always a lady, with Christ and her family being the true loves of her life. Ruby once wrote "Through my Trials and sadness in my life, it is such a joy to know whatever comes my way, God is always beside me thru it all and will never leave my side.� She was a member of the First Baptist Church in Rogers, Arkansas, and she loved her church family deeply. Ruby was a loving wife, caring mother and adoring grandmother. She was a lady of many talents, including shopping avidly and sewing beautifully, but her greatest gift was her love of family and friends. Ruby was a diligent worker at home, but she used this gift in the sales profession as well. Most recently, she worked at Kohl's Department store in Rogers in the jewelry department. She also sold jewelry for Rice Jewelers in Rogers, and she spent many years serving customers at Freddie's Pharmacy. Ruby was preceded in death by her parents; one sister, Huba Cruse; and one nephew, John Tucker. Ruby is survived by a treasure trove of people who loved her including her husband, J. Frank Harrison; two sons and daughter in-laws, J. Frank "Jay� Harrison II and Shenia Harrison, Howard Harrison and Laurie; four granddaughters, Cindy Harrison, Olivia Harrison, Elizabeth Harrison, and Amelia Harrison; two step-granddaughters; two brothers, Sam Boatman and Bill Boatman; two sisters, Loretta Williams and Betty Tucker; seven nephews, Jim Boatman, Mike Boatman, Dennis Boatman, Ed Cruse, Ron Cruse, Gary Cruse and Dave Tucker; eight nieces, Dora Barry, Jackie Williams, Beverly Smith, Heidi Morse, Lisa Cook, Inger Stewart, Lori Boatman, and Lynette Hillenburg. A funeral service will be held on Friday, December 14, 2007, 10 a.m. in the First Baptist Church in Rogers. Visitation will be held on Thursday at Rollins Funeral Home Chapel from 6 until 8. Arrangements are under the direction of Rollins Funeral Home of Rogers, Arkansas. Funeral service for Mr. Elmer Mitchell Neill, age 77, of Nacogdoches, Texas, will be held at 10 a.m. Thursday, November 11, 2004, at First Christian Church with the Rev. Terry Hodge officiating. Burial will follow in Sunset Memorial Park. Mr. Neill died Sunday, November 7, 2004, in Nacogdoches. Born January 21, 1927, in Trawick, he was the son of Wilda D. Neill and Norman Elmer Neill. He was employed as a mechanic for Southern Pacific Railroad. Mr. Neill was a member of First Christian Church for over seventeen years. He loved to fish and hunt deer, was a devoted Astros fan. He was at the Astros game where Mickey Mantle hit the first home run in the Astrodome. Mr. Neill loved playing dominoes, family get-togethers, barbecue, throwing fish fries with homemade ice cream, watching sports on TV and playing basketball through his high school years. Survivors include his wife, LaVerne Grimes Neill of Nacogdoches; daughter and son-in-law, Mitzi Neill and Kelly G. Casey of Yakima, Wash.; sisters and brother-in-law, Jeanette and Larry Johnson of Nacogdoches and Peggy Rowlett of Alvin; and many cousins. Mr. Neill was preceded in death by his parents; his son, Randy M. Neill; and a brother, Tommy Neill. Active pallbearers will be David Johnson, Stanley Johnson, Jerry Dean Neill, Louis Weaver, Richard Johnson and Dustin Johnson. In lieu of flowers, donations may be made to First Christian Church Building Fund 702 Mound St. Nacogdoches, Texas 75961 or Nacogdoches Treatment Center Alzheimer Day Activity Program 119 Hughes St. Nacogdoches, Texas 75961. The family will receive friends from, 4 until 6 p.m. today. James Foster Box, 86, died on May 20, 2004, at his residence in Trawick, Texas. Funeral services will be held in the Trawick Methodist-Presbyterian Church, Trawick Community, at 2:30 p.m. on Friday, May 21. The Reverend Jean Ferraro of Trawick Methodist Church and the Rev. Clifford Horton of Trawick Presbyterian Church will officiate. Burial will follow in the Linn Flat Cemetery. He was born August 9, 1917, in Keltys, Texas, to Avery and Odessa Box. James and Oneta Neill were married March 16, 1940. He was a member of the Trawick Methodist Church and the Woodmen of the World. Mr. Box farmed during the 1930s and 1940s. He worked in the East Texas oil fields during the 1950s. He retired from the Nacogdoches County Road and Bridge Department in 1982. Survivors include his wife, Oneta; sons and daughters-in-law, John Avery and Janice Box of Nacogdoches, James Foster Jr. and Mary Box of Splendora, Texas; and daughter, Sarah Vaught of Trawick. Mr. Box is survived by seven grandchildren, Johnny Box, Kerry Vaught and wife, Sherry, Todd Vaught and wife, Kathy, Tambra Vaught Richardson and husband, Randy, Stacey Box McGalin and husband, Jimmy, Tracey Box Fletcher and husband, Gaylon, and Kelly Box. Thirteen great-grandchildren loved and adored Pap Paw: Courtney and Kaelea Box, Slayton, Kassie and Ayla Vaught, Christy Martinez, Sarah Vaught, Kolby and Kyndal Branton, Madison Richardson, Brittney McGalin and Briana and Eddie Fletcher. Mr. Box is survived by one sister, Joy Perry; and two nieces, Glenda Perry Holland and Karen Sangster. He was preceded in death by his brother, Julian Box; and son-in-law, Wendell Vaught. Pallbearers will be Johnny Box, Kerry Vaught, Todd Vaught, Doug Neill, Ken Neill and Shane Neill. Honorary pallbearers will be Harold Neill, Jerry Neill, Marion Neill, Tandy Neill, Richard Williams, Neill Williams and Paul Sparks. Memorial donations may be made to the Trawick Methodist Church Building Fund. Margaret Ellen Plunkett, 83, passed away peacefully December 22, 2004, at Shawnee Mission Medical Center. Funeral services will be 10 a.m. Friday, December 24 at George Combs Chapel, Country Club Christian Church at 61st and Ward Parkway, Kansas City, MO. Visitation will be 9-10 a.m. Friday at the chapel. Following the service will be a private burial at Elliott Grove Cemetery, Brunswick, MO. The family requests no flowers. In lieu of flowers, memorial contributions may be made to the Country Club Christian Church Choir. Margaret was born November 10, 1921, to Judge William G. and Myrtle Mitchell of West Frankfort, IL. Margaret graduated from the University of Missouri with a degree in Journalism, and was Miss Mizzou of 1940. While attending college in Columbia, she met her future husband. In 1947, Margaret was united in marriage with Thomas H. Plunkett in St. Louis, MO. Although they made their permanent home in Overland Park, they enjoyed extensive travel around the world and celebrated their 57th wedding anniversary last June. Margaret was an active member of Pi Beta Phi Alumni Club, P.E.O. Sisterhood, Daughters of the American Revolution-Shawnee Mission Chapter, Circle Women's Ministries of Country Club Christian Church, and sang in their Chancel Choir for 25 years. Margaret was preceded in death by her parents, Judge William G. and Myrtle Mitchell, daughter Penny Johnson, and sister Mary Jane Carmichael. She is survived by her husband Thomas Plunkett, of the home; daughter Nancy Plunkett; daughter and her husband Meg and Kent Groff, Solsberry, IN; son-in-law Ken Johnson; and six grandchildren, Angela, Jessica, Sara, Christopher, Emily, and Faith. Benjamin H Gullett, 93, of 27 Grove Drive, died Friday at 8:55 p.m.at St. Mary's Hospital. He was born in Elizabethtown, son of William Waitman and Julia Emma (Hungerford) Gullett. In 1919 he married Mary Mitchell in Eldorado. Survivors include his wife, Mary; a daughter, Jeanne Henking of Pittsburgh, Pa.; and three grand children. Mr. Gullett moved to Centralia in 1974 after living in Decatur for many years. For about 50 years he and his brother, Charles, were owners of Central Illinois Investment Co. in Decatur. He was a member of the First United Methodist Church in Decatur and attended the First United Methodist Church in Centralia. He was a 70-year member of the Masonic Lodge and was affiliated with the Springfield lodge. He also was a member of the Scottish Rite, Valley of Springfield; Ansar Temple of the Shrine in Springfield; The Decatur American Legion; Alpha Tau Omega Fraternity of Delaware; Ohio; and he attended both Ohio Wesleyan University at Delaware, Ohio and Southern Illinois University at Carbondale. He was a longtime member of the Decatur Club and the Decatur Country Club. He was active in Republican Party politics in Decatur for many years and served for many years as a precinct committeeman. Mr Gullett was a captain in the U.S. Army during World War 1 and served in the infantry and cavalry in France. Funeral services will be held tomorrow at 1 p.m. in the chapel of Luer Funeral Home with Rev. Duane Ambrose officiating. Burial will be in Raleigh Cemetery. Funeral services for Nadiene Peters, 66, of Gainesville, were held Monday, Nov. 6, at Mammoth Assembly of God, Gainesville. Burial was in Sanders Cemetery. Mrs. Peters died Thursday, Nov. 2, 2006, at her home. She was a graduate of Kansas University and a retired recreational therapist. She was a devoted wife and mother. She was a member of the Mammoth Assembly of God and her life centered around her family and charity work. She felt that few things were more important than family, friends and helping people in need. Mrs. Peters is survived by her husband, Gerald; six children, Ron Martin, Rick Martin, Barveta Gibbs, Mary Hillebert, Holly Stites and Christy Martin; her mother, Helen Trivitt of Mountain Home, Ark. ; 13 grandchildren, Shawn Martin, Brian Gibbs, Andrea Harris, Jacob Gibbs, Joshua Gibbs, Timothy O?Driscoll, Shanna Martin, Melissa Martin, Katelynn Martin, Chance Stites, Jennifer Adams, Nicole Martin and Devon Rowell; five great-grandchildren; one brother, Bill; four sisters, Marviene (her twin), Judy, Joann and Janice; and many more relatives and friends. NELSON - Ruth C. Nelson, passed away November 10, 1974. A native of Illinois and a resident of this area since 1920 where she was a member of Altadena Chapter No. 526, O. E. S. and Calvary Baptist Church. She is survived by her dadughter, Mrs. Arthur (Marlon) Switzer of Arcadia; sister, Mrs. Carl (Helen) Beck of Bakersfield and brother Daniel P. Choisser. Services 2:00 P.M. today at Memory Chapel, Ives & Warrren Company, 100 North Hill Avenue. Rev. Charles Peterson officiating. Private Internment Montecilo Memorial Park, Redlands. Memorial contributions may be made to a favorite charity in her memroy. Jesse Edward Hayes, of Rolla,Missouri passed away Thursday, November 15, 2007 at the age of 87. He was born in Beulah, Missouri on June 29, 1920 to the late John F. and Mattie (Yowell) Hayes. On November 8, 1941 he married Evelyn Brumble, who survives. Jess was a veteran of the U.S. Army having served during WWII. He was an avid hunter and outdoorsman and was known for his hand crafted turkey calls. His surviving family includes his wife Evelyn, of the home; one son, Charles Hayes and wife Joyce, of Springfield, MO; one brother, Henry Hayes, of Cuba; a granddaughter, Lisa Phillips and husband Terry, of Springfield; and two great granddaughters, Taryn and Presley Phillips. The funeral service for Jess Hayes will be held at 1 p.m. Saturday, November 17, 2007 at the Null & Son Funeral Home. Interment will follow in the Rolla City Cemetery. In lieu of flowers, memorial contributions are suggested to the First Christian Church in Rolla MO. All arrangements are under the direction of the Null & Son Funeral Home in Rolla. WEBBER--At her home, Galatia, Ill., Mrs. A. J. Webber, December 21, 1918, of heart disease, mother of Henry Webber, Mrs. Hary Burns, and our dear grandmother, and aunt of W. E. Webber, of St. Louis. 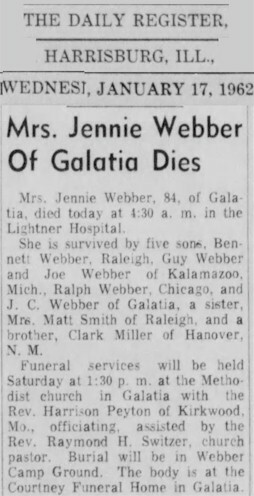 Funeral Monday, 1:30 p.m., Galatia, Ill. Mrs. Webber was the daughter of John Webber and wife, the first settlers of Rolla. She was a child when Rolla was adopted as the county seat of Phelps county. Her home was here for years. 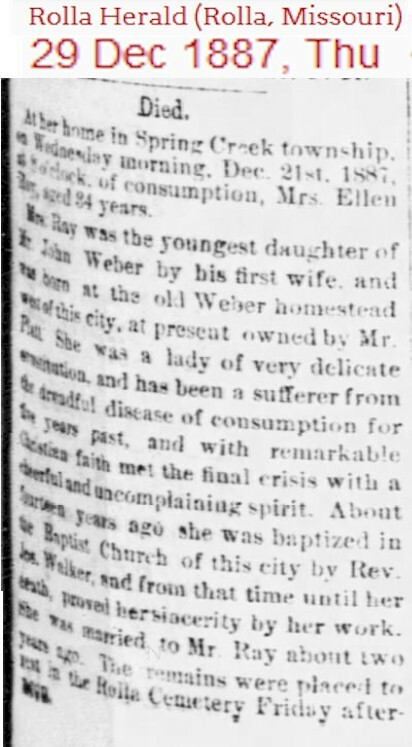 She united in marriage with Mr. A. J. Webber, of Galatia, Ill. They were among the wealiest people of Galatia. Mr. Webber died several years ago. 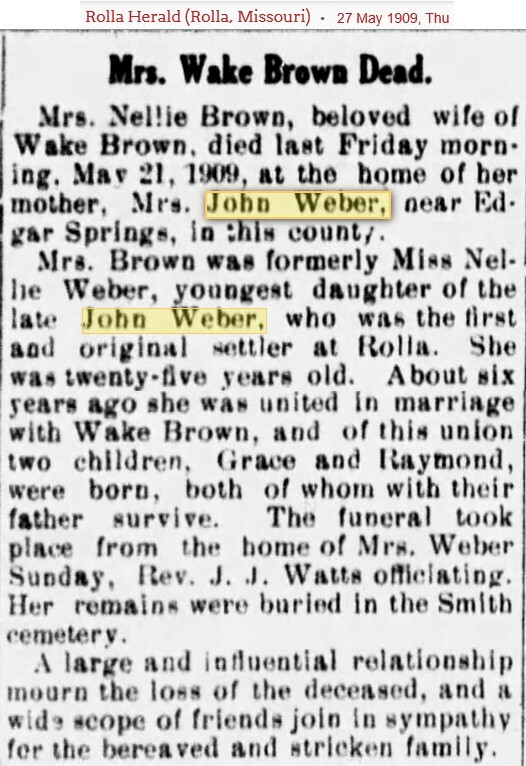 Mrs. Webber generally made a visit to Phelps county about every two or three years to visit her brother, A. F. Webber, who now resides near Newburg. She also visited other relatives in this county, and in and around Rolla. The bright little daughter of Atty. and Mrs. Will G. Mitchell of West Frankfort died Sunday morning at the home of his parents, Mr. and Mrs. T. G. Mitchell. 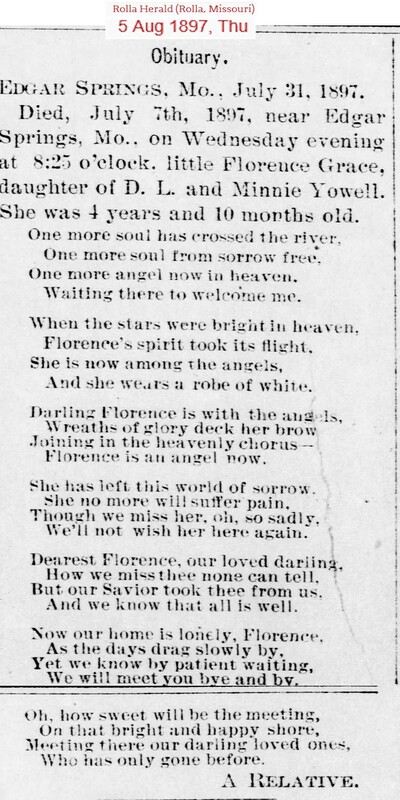 Little NELL E MUSGRAVES MITCHELL was twenty months old, the only child and the jewel of the parents and grandparents, and her death is a great blow to them. The heartbroken family have the sympathy of their host of friends in their bereavement. The little one took seriously ill with stomach and bowel trouble at their home in West Frankfort several days ago and the parents removed her here to give every medical aid available but nothing did any good or relieved her--death followed. Funeral services were held at the Mitchell home two o'clock Monday afternoon conducted by Rev. G. R. Goodman, pastor of the M. E. church, interment followed at the Masonic cemetery. A large crowd attended the funeral and the local attorneys acted as pall bearers. Mrs. Josephine Musgraves, a highly respected citizen and Christian lady, died Monday night at the home of her daughter, Mrs. Thos. G. Mitchell. She has been seriously ill for several months during which time she has had the most careful care and attention but death came as a relief to her suffering. Until her last illness she resided at her home on Grant street. Deceased was seventy three years of age and was the widow of the late William Musgraves. A large circle of friends were grieved to learn of her death and extend sympathy to the bereaved family. Funeral services were conducted at the Methodist chruch Wednesday, two o'clock, by the pastor, Rev. G. R. Goodman, followed by interment at the Raleigh Masonic cemetery. Thomas Mitchell, son of Mr. and Mrs. Thomas Mitchell, was born June 21, 1894. Died at the home of his parents November 20, 1919, aged 25 years, four months and 29 days. He is survived by a father and a mother, three sisters and one half brother and one half sister. One sister and one half brother preceeded him in death. In his early years Thomas was not a Christian but during his last illness he professed faith in Christ. He spoke often of his new found hope and urged and exhorted his loved ones to accept Christ and be saved from the consequences and the wages of a life of sin. In his agony and suffering as the end drew near, he often prayed to be permitted to pass into the life beyond. He requested those who watched with him to sing some songs that were dear to him, and up to the last moments he would lift his voice and join in the singing. Without fear or shudder of sorrow he passed gently at the last into death his one regret was that he had not yielded his life to Christ in earlier years. His last message to loved ones and friends alike was a warning to prepare to meet God. Funeral services were held at the First Baptist church in this city, Friday, November 21, 1919, at 2 p. m., conducted by the pastor, Rev. A. E. Prince. The body was laid to rest in Wolf Creek cemetery. Survivors include a son, Eugene, of Enid, OKla; two brothers, Virgil Webber of Mountain Home and Homer Webber of Frisco, Tex; five sisters, Misses Pearl Webber and Rosien Webber, Mrs. Lillie Presley, Mrs. Althea Gunter and Mrs. Maxine Partee, all of Mountain Home; two grandchildren and a great-grandchild. Funeral services were scheduled for Wednesday afternoon at the First Baptist Church with the minister, Rev. Harold Elmore, officiating. Interment was in the Conley Cemetery, north of here, under the direction of the McClure-Smith Service. Pallbearers were Ray Byrd, Harlin Byrd, Freddie Byrd, Gene Duck and Bill Medley. Webber, Edith P., 89, retired Beech Aircraft silkscreen and paint employee, died Monday Aug 4., 2003 Service 10 a.m. Thursday, Resthaven Mortuary. Preceded in death by parents, Calvin A. and Edith P. (Clark) Gale, 7 brothers, 2 sisters, and 1 granddaughter. Survivors: sons, Virgil of Agusta, Newton A. of Wichita; daughters Juanita Dodge, Nancy Webber both of Wichita, 9 grandchildren,: 12 great=grandchildren; 4 great-great-grandchildren, numerous nephews and nieces. Memorials established with Hospice Care of Kansas. Ed Dorado., Andover Hearth Care Center and Senior Services Inc. He was born in Crainville Sept. 25, 1885, the son of Henry and Orlena Crain Beltz. He was a retired miner and a member of United Mine Workers Local 1776. He leaves daughters, Mrs. Avis Romanelli and Mrs. Alice Vossel, both of Chicago, and Mrs.Mae Ella Berteau of California sons, George of Willits, Calif., and Elwin of Oakford, Penn. ; brothrs Garvis and Kenneth, both of Energy and Fletty of Marisso; and a sister Mrs Maggie Ice of Marion. Funeral services will be at 2 p.m. Thursday at the George Van Natta Funeral Home, Herrin. The Rev. J.E. Gray will officiate. Burial will be in Herrin City Cemetery. Friends may call after 4 p.m. today at the funeral home. Funeral services were held today at 1:30 p.m. in the Finger Funeral Home in Marissa for Fleety E Beltz, 80, of Marissa. Burial was in Oakwood Cemetery in Carterville. The Rev. John Welch officiated. Mr. Beltz died at 2 p.m. Wednesday in Community Hospital in Sparta. He was a retired tavern owner. He had been mayor of Old Marissa before the old and new Marissa came under the same jurisdiction. Mr. Beltz was born March 15, 1894, to henry and Orlena Crain Beltz in Energy. He married Mrs. Carrie Roach Wright in 1922 in Benton. Survivors include his wife of Marissa; two brothers, Kenneth and Garvis of Energy; a sister whose name and address are unavailable; one step-grandchild; four step great-grandchildren; and one step great-great-grandchild. Two infant sons, two brothers, a sister and a half-sister preceded him in death. Marion Webber Whitley, 46-year-old former Harrisburg resident who is well-known here, died at 9:30 p.m. Friday in Chester memorial Hospital of injuries received at 6:15 p.m. Wednesday in a two-car crash on Ro9uth 150 three miles northeast of Chester. 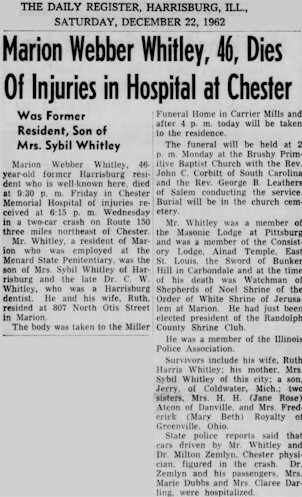 Mr. Whitley, a resident of Marion who was employed at the Menard State Penitentiary was the son of Mrs. Sybil Whitley of Harrisburg and the late Dr. C. W. Whitley, who was a Harrisburg dentist. He and his wife, Ruth resided at 807 North Otis Street in Marion. The body was taken to the Miller Funeral Home in Carrier Mills and after 4 p.m. today will be taken to the residence. The funeral will be held at 2 p.m. Monday at the Brushy Primitive Baptist Church with the Rev. John C. Corbitt of South Carolina and the Rev. George B. Leathers of Salem conducting the service. Burial will be in the church cemetery. 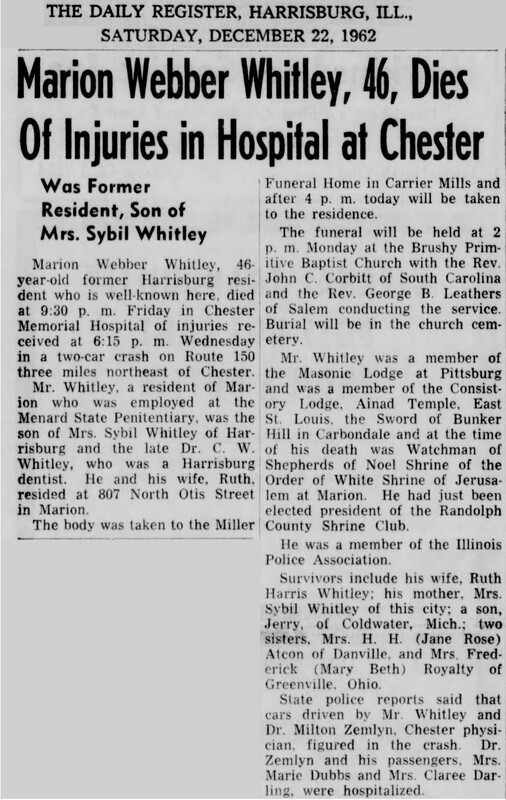 Mr. Whitley was a member of the Masonic Lodge at Pittsburg and was a member of the Consistory Lodge, Alnad Temple, East St. Louis, the Sword of Bunker Hill in Carbondale and at the time of his death was Watchman of Shepherds of Noel Shrine of the Order of White Shrine of Jerusalem at Marion. He had just been elected president of the Randolph County Shrine Club. He was a member of the Illinois Police Association. State police reports said that cars driven by Mr. Whitley and Dr. Milton Zemlyn. Chester physician, figured in the crash. Dr. Zemlyn and his passengers, Mrs. Marie Dobbs and Mrs. Clarce Darling were hospitalized. Dr. C. W. Whitley, 67, prominent Harrisburg dentist, died suddenly at 1:30 p.m. Thursday at the mayo Clinic in Rochester Minn. He had been ill several months. He leave his wife, Mrs. Sybil Webber Whitley; two daughters Mrs. Mary Elizabeth Royalty, of Dayton, Ohio, and Mrs. Jane Rose Acton, of Danville; one son, Marion of Marion; and one sister, Mrs. Hannah Whitley Mulholland, of Los Angeles, Calif.
Services were to have been held at 3 p.m. Sunday in the Harrisburg Presbyterian Church. The Rev. C. C. Hall of Carbondale, and the Rev. W. L. Cummins, of Harrisburg, were to have been in the Harrisburg City Cemetery. The Turner Funeral Home of Harrisburg was in charge. Pearl Webber Norman, 84, of 210 S. main St., Harrisburg, died at 1 p.m. Friday at the Country Club Manor, Harrisburg. She was born Sept. 28, 1888 in Stonefort, the daughter of H. L. and Jennie Webber. She was married to P. J. Norman. He preceded her in death in 1935. She was a regent for three years of the Washington D. C. chapter of the Daughters of the American Revolution. She served on the Board of the District of Columbia chapter house. She attended several of the nation Republican Conventions. She was a member of the Pen Women�s Club, Washington, D.C., the Eastern Star and the Rebekahs. She is survived by a daughter, Mary Parker of Harrisburg; a sister, Sybil Whitley of Harrisburg and grandson, Richard Parker of Harrisburg. Funeral services will be at 2 p.m. today at Gaskins Funeral Home, Harrisburg, with the Rev. Harold Garrett officiating. The burial will be in the Webber Camp Grounds Cemetery, Harrisburg. Services for Nora Webber, 77, of Galatia will be 2 p.m. Today in the Courtney Sloan Funeral Home of Galatia. Mrs. Webber died at 1:45 p.m. Friday in the Pearce Hospital of Eldorado. The Rev. Durian Durey will officiate at the service. Burial will be in the Webber Campground Cemetery of Galatia. Friends may call at the funeral home until funeral time. In lieu of flowers the family requests that contributions be made to the Cancer Society. Mrs. Webber was a daughter of John G. and Mary R Holliday Hughes. 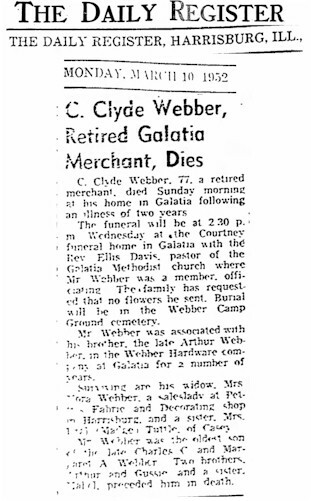 She was married to Clyde Webber, who preceded her in death. She is survived by a brother, Paul M. Hughes of Carbondale; sisters, Mrs. W. R. Wisewell of Carbondale, Mrs. J. R. Thompson of Huntington Beach, Calif., and Mrs. Jennie Glasser of meridian, Miss. Two brothers preceded her in death. 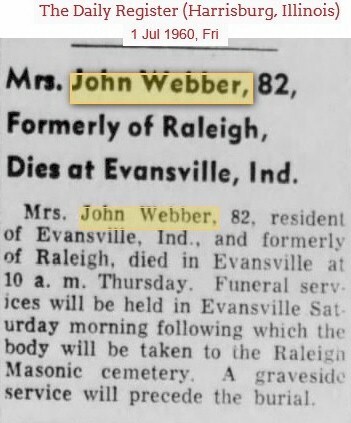 Mrs. John Webber, 82, formerly of Raleigh, dies at Evansville, Ind. Mrs. John Webber, 82, resident of Evansville, Ind., and formerly of Raleigh, died in Evansville at 10 a.m. Thursday. Funeral services will be held in Evansville Saturday morning following which the body will be taken to the Raleigh Masonic cemetery. A graveside service will precede the burial. 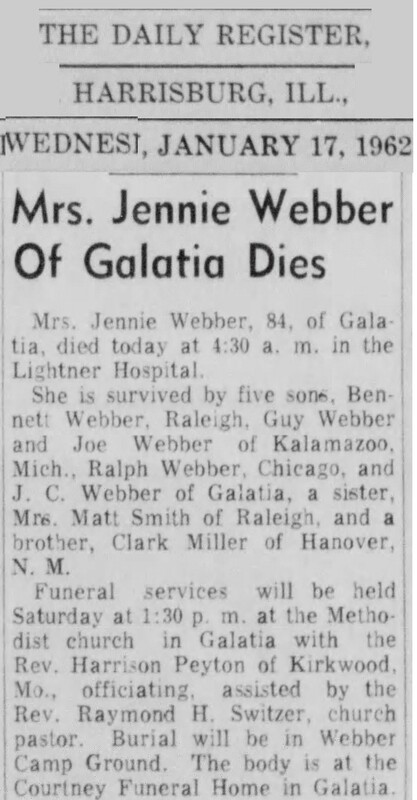 Word has been received here of the death of Mrs. Leah Webber, widow of j. H. Webber, formerly of Galatia. Mrs. Webber died at the home of her daughter, Mrs. Jack Hahne, 2299 Ashbourne Drive, San Marino, Calif., Wednesday. In addition to Mrs. Hahne she is survived by two other sons, Ward Webber, Los Angeles, Calif., and Gene A. Webber, Baltimore, Md. Funeral services will be Saturday in California and burial will be in Forest Lawn Cemetery there. Edgar J. Webber, 71, a native of Arkansas and a resident of Santa Cruz county for the last 11 years, died yesterday in the local hospital. He was retired secretary-treasurer of the Granat Brothers jewelry firm in Stockton. He lived at 1230 Mount Hermon road. 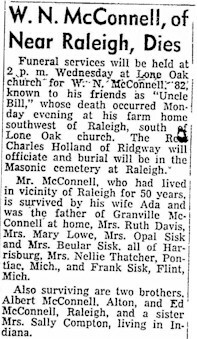 He is survived by his widow Maude Cowell Webber; three daughters, Mrs. Louise Blewitt of Burlingame, Mrs. Janel Lentz of Santa Cruz and Mrs. Jean Fugit of Boron, and seven grandchildren. The remains were forwarded to Whit�s mortuary yesterday to the B. C. Wallace and son mortuary in Stockton where services will be conducted tomorrow. Maude C Webber, 87, died Tuesday in Santa Cruz. She was a native of Stockton. Surviving are two daughters, Mrs. Janet Lentz of Santa Cruz and Mrs. A. Jean Fugit of Jacksonville Beach, Fla.; and by seven grandchildren and seven great-granchildren. Services were held at Whit�s chapel today at 11 a.m. with the Rev. William Phillips of the First United Methodist Church officiating. Interment will be in the Rural Cemetery in Stockton. Charles V. Weber, 97, of Fallbrook died Wednesday. He was born in Edgar Springs, Mo., and was a pastor emeritus for Oceanside Community Church. He is listed in " Who ' s Who in American Life. " Survivors include his wife, Roberta; daughter, Phyllis Mahaffey of Vista; sons, C. Vance Jr. of San Bernardino and Donald of Pismo Beach; nine grandchildren; 19 great-grandchildren; and four great-great-grandchildren. Services: 2 p.m. tomorrow, Oceanside Community Church, 107 S. Clementine St., Oceanside. A scattering of ashes at sea was planned. Donations: Oceanside Community Church, 107 S. Clementine St., Oceanside, CA 92054 or the Fallbrook Gem & Mineral Society, 260 Rocky Crest Road, Fallbrook, CA 92028. Arrangements: Berry-Bell & Hall Mortuary. A.T. Webber, an old citizen of Baxter County, died at Stockton, Cal., on Saturday morning. He has many relatives and friends among the old settlers who will mourn his death deeply. He was the son of Uncle Joe Webber, a pioneer settler who used to live near where Benville is now. On Dec. 27 1882 he married Jennie Smith, daughter of Mr. and Mrs. A.P. Smith, who were among the oldest settlers in this part of the state. Several years after the marriage they moved to Stockton, Cal. where they have resided since. His wife, two daughters and a son, survive him. He was nearing his 59th birthday when he died. His death was not unexpected, as he had been troubled with an enlarged artery for some time. He was operated on a short time ago. He died suddenly. He was well in the morning, and asked his wife to fix him some medicine and walked into the kitchen to get it. She noticed him spit some blood in the sink. At that time he said, �I am gone this time.� They carried him to a couch and he expired before a physician could reach him. He was not afraid to die and had often said he was prepared to go. The deep sympathy of friends and relatives here are extended to the widow and children in Stockton. Barty Webber is the second Baxter county boy to give up his life for the honor of his country and the democracy of the world. All honor to these boys who are fighting for us on the Western Front, so that we may live a life of freedom and out children may live unshackled by autocracy. At another place in this paper is a letter from the Chaplain of his company, which does him honor. Barty was a Baxter County boy the son of Henry Webber, a well-known farmer who lives north of town. He was born Oct., 26, 1895, and lived his life among us in this section. Before he sailed to France, he consecrated his life to God, having been converted at Little Rock and baptized at New York. The people of Baxter county, cannot sympathize too deeply with the bereaved, nor can they respect and honor the departed too greatly. When a man give his life he give his all. We believe that his soul is with God. The Bulletin extends to the bereaved its greatest sympathy. His name will ever remain in the minds of the Editors ___ ___ ___ of sacrifice; of freedom; of democracy, the things for which he laid down his life. The sad news of the loss of your son has been communicated to you no doubt by the government officials. Private Arthur B. Webber, No. 1587572, Company F. 153rd Infantry, 39 Division, 6th Company Camp Beaureguard Replacement Draft, was drowned in the Cher River about three-fourths of a mile below St. Aignan bridge, at 8:30 p.m. July 1st, 1918. The body was recovered yesterday morning, July 4th about a quarter of a mile below. The official Board of Inquiry of which I was a member decided that Arthur lost his life in the line of duty and not due to his misconduct. This is a very dangerous river and orders have been issued forbidding swimming in it. He was buried yesterday, July 4th afternoon and with military honors and many of the boys gave up their holiday sports to render last honors to him. I told them that it would be a source of consolation to you to hear that they rendered this homage to their brother in arms. He is buried in section O Grave 16 in St. Aignan cemetery, St. Aignan-Noyers, France. Department of Loiret Cher. May God accept the sacrifice of this life as he does that of those who die on the field of battle. Tom Sorrells, aged 66, and one of Baxter County�s pioneer farmers died at his home west of town last Friday, after a lingering illness. The funeral was held at the Conley cemetery where three of his sons rest. A wife survives him. Mr. Sorrells was raised in this county and has made it his home ever since childhood. He was one of the county�s most substantial citizens and was loved by all who knew him. His life was marked by good deeds and kind thoughts and his death will be mourned by all who knew him. Claude Allen Webber, 74, retired city of Independence employee died Sunday July 1, 1990. Services will be held at 9 a.m. today at Mount Hope Cemetery. Services 10:30 a.m. Thursday at St. Andrews Catholic Church. Survivors: daughter Teresa Lynn Strasburg; mother Marjorie Bahr; companion Judi Johnson; 8 grandchildren. Felts, Eva Lena, 91, former Kansas Masonic Home aide, formerly of Wichita, died Tuesday, December 20, 1994. Survivors include brothers Tom Webber of Rogers Arkansas, Toney Webber of Midwest City, Oklahoma; sister Margie Bahr of Windsor, Missouri. Henry Thomas Webber, 68, well known farmer in the Altamont vicinity died at his home two miles west of Parsons at 6:00 o�clock Tuesday afternoon from the effects of a heart attack. He had been in failing health for several years. The remains were held in state at Martin & Fritz Funeral Home until the hour of the funeral, which was held at the Baptist Church at 2:00 o�clock this afternoon. Charles Palmer of the Church of Christ at Parsons, had charge of the funeral discourse, assisted by Rev. J. C. Williams, local Baptist pastor. Burial was made in the Altamount Cemetery. Henry Thomas Webber was born May 4, 1872, near Mountain Home, Ark. On September 18, 1891, he married Ada Deatherage. Fourteen children were born to them, nine of whom survive with the widow. One son Arthur B. Webber, died in France during the World War. The surviving sons are Tom Webber, Ft. Bliss, Texas; Bert Webber, Ottawa; Tony Webber, Altamount and Claude of the home. Daughters are Mrs. Clyde Pumphrey, West Palm Beach, Fla., who arrived yesterday by airplane; Mrs. Geo. Harden, Tulsa; Mrs. T. J. Shauffler, Altamount; Eva, Ada and Marjorie, all of the home. He was a member of the Church of Christ since boyhood. Noah J. Crain, 88, of 505 E. Grand Ave., Carterville, died at 9 a.m. Saturday at his home. Born April 22, 1874, south of Carterville, he was the son of Warren and Mary Hampton Crain. He married the former Leona Ford in 1895 at the New Hope settlement, south of Carterville. She died May 3, 1926. Mr. Crain was a retired farmer. He was a member of the Carterville First Baptist Church. He leaves daughters, Mrs. Fay Skinner, Mrs. Opal Crain and Mrs. Sibyl Garrison, all of Carterville; son, Wade of Fisk, Mo. ; and one grandchild. A son, Bernard, died in 1932. Funeral services will be at 2 p.m. Monday at the Riggin Funeral Home, Carterville. The Rev. Mitchell Bennett will officiate. Burial will be in the South County Line Cemetery, southwest of Carterville on the Giant City road. Friends may call at the funeral home after 3 p.m. today. Mrs. Robert Hampton, 67, died at the home of her daughter, Mrs. Geo. Crowther, at Carterville yesterday, according to word to her niece, Mrs. Jesse Anderson, of Carbondale. Funeral services at Hampton church, Carterville, at 2 o�clock tomorrow afternoon. 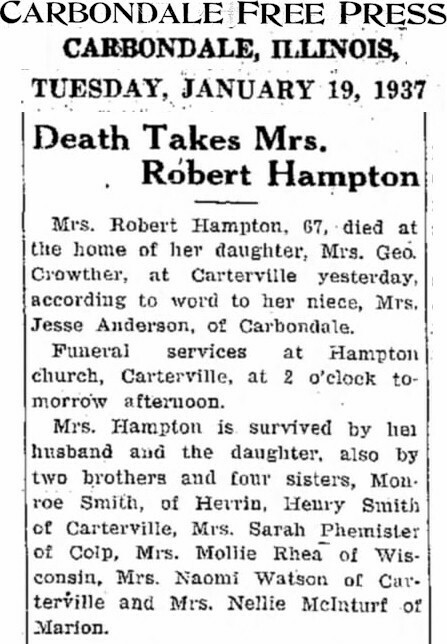 Mrs. Hampton is survived by her husband and the daughter, also by two brothers and four sisters, Monroe Smith, of Herrin, Henry Smith of Carterville, Mrs. Sarah Phemister of Colp, Mrs. Mollie Rhea of Wisconsin, Mrs. Naomi Watson of Carterville and Mrs. Nellie McIntuf of Marion. Mrs. Dona Henderson, 81, of 206 W. Oak St., West Frankfort, died at 1 a.m. Sunday in Union Hospital, West Frankfort. She had been ill several years. 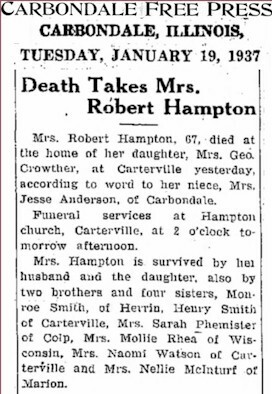 She was born March 22, 1883, in Williamson County, daughter of Mr. and Mrs. Tut Hampton. She was a member of the West Frankfort First Christian Church. She had been a West Frankfort resident 43 years. She leaves her husband Hugh and three nieces. Funeral services will be at 1 p.m. Wednesday in Reedy Funeral Home, West Frankfort. Francis Hamilton, First Christian Church pastor, will officiate. Burial will be in Tower Heights Cemetery, West Frankfort. Friends may call after 10 a.m. Tuesday at the funeral home. 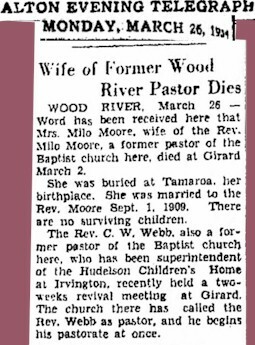 WOOD RIVER, March 26 � Word has been received here that Mrs. Milo Moore, wife of the Rev. Milo Moore, a former pastor of the Baptist church here, died at Girard, March 2. She was buried at Tamaroa, her birthplace. She was married to the Rev. Moore Sept. 2, 1909. There are no surviving children. The Rev. C. W. Webb, also a former pastor of the Baptist church here, who has been superintendent of the Hudelson children�s Home at Irvington, recently held a two-weeks revival meeting at Girard. The church there has called the Rev. Webb as pastor, and he begins his pastorate at once. William Ernest Martin, 55, 728 South Pennsylvania, died Thursday afternoon in Epworth Hospital where he had been a patient for the last ten days. Mr. Martin came to Liberal in 1923 from Holdenville, Okla. He went to work for the Rock Island and except for a brief period had been employed in the maintenance department of the railroad since that time at various stations between Herrington and Tucumcari, N.M. He was a maintenance foreman at the Liberal station at the time of his death. Mr. Martin was a member of the Baptist church. He was a past mast at the Liberal Masonic Lodge, a post district deputy of the Grand Lodge of Kansas, a member of the Liberal Royal Arch masons, the Liberal Commandery and the Dodge City Council. He is survived by his wife the former Esther Hague, one son, Charles, Liberal; two daughters, Mrs. Gerald Glenn, Fowler and Mrs. Mae Zortman, Colorado Springs; three sisters Mrs. Harriett Norris, Hutchinson; Mrs. Douglas Sears, Pratt; and Mrs. Ed Roberts, Holdenville; and seven grandchildren. Funeral services will be conducted at 2 p.m. Saturday from the First Baptist Church by Rev. Mollenhauer. Burial will be at the Liberal Cemetery with the Masonic Lodge in charge of the services at the graveside. All Masons are requested to meet in the Masonic hall at 1:15 p.m. Saturday to prepare of the services. The Miller Mortuary is in charge of arrangements. Mrs. Ada A. Webber, 89, Independence, formally of Parsons, died last Thursday at Mercy Hospital in Independence after being a patient there for three weeks. She had suffered a hip fracture in a fall at her home. She was a member of the Church of Christ in Parsons. Survivors are six daughters, Mrs. Minnie Schauffler and Mrs. Goldie Hardin, Wichita; Mrs. Eva Felts, Independence; Mrs. Grace Pumphrey, Jacksonville, Fla; Mrs. Ada Acock, Parsons, and Mrs. Marge Bahr, Barstow Calif; four sons, Martin B Webber, Oswego; Thomas Webber, Santa Barbara, Calif; Tony Webber, Oklahoma City formally of Altamount; and Claude Webber, Independence; seven grandchildren and eleven great-grandchildren. She was a Gold Star mother. Mrs. Elta Sheldon, 80, of 320 N. Florida died at 10:05 last night in the city hospital. Born in rural Columbus, Oct 6, 1877, the daughter of John and Alice Wilson, Mrs. Sheldon had resided in and around the city most of her life. On January 1, 1901 she was married to Charles Allen Webber. To this union one daughter, Eva, was born. 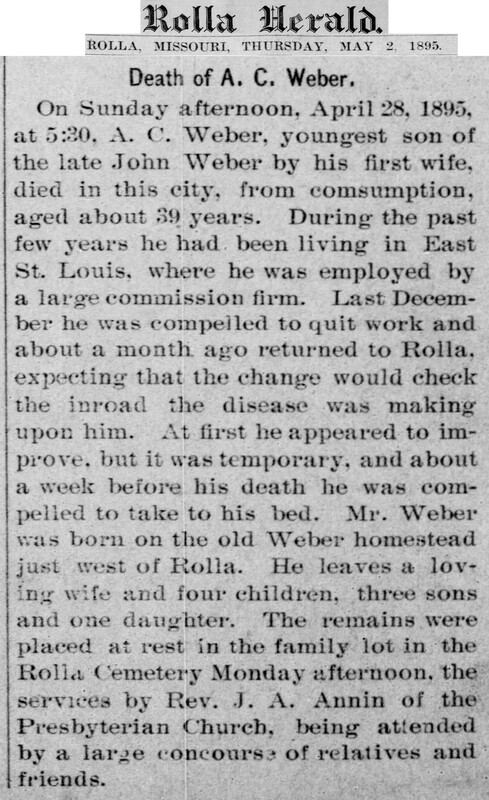 Mr. Webber died March 27, 1904. On July 27, 1905, Mrs. Sheldon was married to Lewis Arthur Sheldon in Delta, Colo. To this union were born seven children, three of whom died in early childhood. Mr. Sheldon preceded his wife in death on September 20, 1944. Survivors include three daughters, Mrs. Eva Toohey of Gardena, Calif., Mrs. Eurela Phillips of Santa Ana, Calif, and Mrs. June Lawrence of Pomona, Calif; two sons, Ross S. Sheldon of Pittsburg route three and John G. Sheldon of Miami; two sisters, Mrs. Narcia Waters of Whittier Calif, and Mrs. Florence Kaufman of Hesperia, Calif; five grandchildren, three great-grandchildren and many other relatives and friends. In her youth, Mrs. Sheldon became a member of the Church of God. Later she became a part time minister and always a devoted worker. She and Mr. Sheldon were among the first members of the Church of God here and helped the building of the church. Funeral services will be conducted at 2:30 tomorrow at the First Church of God with the Rev. H. C. Lockard officiating. The body will lie in state at the Jordan Funeral Home until time of the service. Interment will be at Edgman Cemetery. Mrs. Edna Dablemont was reported as slightly improved today in Wesley Medical Center from gunshot wounds received Monday night. The Andover woman�s condition was listed this morning as serious. She was reported in critical condition Tues after undergoing surgery for wounds in neck, back and left thigh. The shooting occurred following an argument between Mrs. Dablemont and her estranged husband, David Dablemont. Dablemont, 35, died from a self-inflicted wound after the shooting of his former wife four times. Divorce action on the couple had been completed and Mrs. Dablemont had returned to the home southeast of Andover to pick up her belongings. A second article in the Daily Gazette August 14 said basically the same thing except it added that David Dablemont�s body had been taken to the Rolla Funeral Home but arrangements had not been made yet. Ewing Burnett son of Mr. and Mrs. Roy W. Burnett of Dodge City drown Sunday in Denver, according to word received here from his brother Allen Burnett, who also is in Denver. Particulars of the tragedy had not been learned here at noon. Mr. Burnett was attempting to get in tour with his older son in Denver. Allen Burnett had been in Denver a year and he was joined there six weeks ago by Ewing Burnett who had found a job in Denver. He planned soon to take his wife and two small sons, who are in Coldwater, to Denver. Arrangements will be made to bring the body here for burial. Mr. Burnett was reared in Dodge City and Larnard. He was associated with his father in the grocery and market business here and later he operated a butcher shop in Coldwater. He had worked at the painter�s trade in Ashland since then. He is survived by the widow and two small sons, Bobby and Donald of Coldwater; his parents Mr. and Mrs. Roy W. Burnett of Dodge City; a brother Allen of Denver; and a sister Mrs. Vern Popp of Kinsley. James C. Blackim, 67, died Monday night in Wichita. He was born June 22, 1902 in Glascow, Scotland. He moved from Dodge City to Wichita in 1926. He and Lillian Kinkaid were married in Dodge City in 1927. He was a member of the State Board of Pharmacy and a lifetime member of the Kansas Drug Travelers and Allied Industries. Survivors include the widow of the home; one son Charles J of Wichita; a brother David F of Wichita; two sisters Mrs. Jack Hein of Marion and Mrs. Vern Dietrick of Herrington and two grandchildren. Funeral services will be at 10 am Thursday at the Cochran Chapel in Wichita. Graveside services will be at 3 pm Thursday at Maple Grove Cemetery in Dodge City. Ralph H. Burnett, 72, former resident died yesterday in San Bernardino, California, according to word received today. The body will be brought to Dodge City and the Rev. David P. Birch will conduct the funeral services at 10 am Saturday in the Hulpien-Swain Chapel. Burial will be at the Maple Grove Cemetery. Mr. Burnett was a son of the late H. A. Burnett president and later chairman of the board of the First National Bank. Ralph Burnett was in the grocery business here in the 1920�s later moving to Salina and engaging in the transfer business. Until ill health prevented, he made frequent visits to Dodge City. Last August he went to San Bernardino to make his home with a son, Robert, who with two grandchildren survive. Miss Lucille Kinkaid local resident is a niece. Mrs. Louise K Blackim, 79, of 103 University, died April 15, 1985, at her home. She was born Louise K Kinkaid October 13, 1903 in Dodge City to Charles and Stella Kinkaid. She grew up in Dodge City and graduated from local schools. She was a 1923 graduate of Washburn University. She married James C. Blackim May 5, 1927. She taught at schools in Wichita and for one year a Central School in Dodge City, was a member of the Dodge City Presbyterian Church and Daughters of the American Revolution and had lived in Dodge City since 1975 moving from Wichita. Survivors include one son Charles J of Norton; one sister Lucile Kinkaid of Dodge City and two grandchildren. The funeral will be at 10 am Wednesday at Swain Funeral Home and Rev. Thomas Church officiating. Burial will be at Maple Grove Cemetery. Friends may call until 8 pm today and until time of services Wednesday at Swaim�s. The family suggestion memorial contributions be made to the church or Meals on Wheels. Mrs. Ralph Burnett, 63, of Salina, died there Tuesday following a surgical operation. Mrs. Burnett�s maiden name was Eleanor Milton. She was born here October 30, 1888. Her Parents were Mr. and Mr. B. F. Milton. The father for many years was a prominent lawyer. Mrs. Burnett attended school here then was a student at Bethany College in Lindsborg and Fairmont College in Wichita. She was an accomplished musician. Before her marriage she taught in the local schools in Salina. She was active in church and civic affairs. Survivors are her husband; a son Richard Burnett of Salina and two grandchildren. The body will be brought to Dodge City and graveside funeral services conducted at 3 p.m. Friday in Maple Grove Cemetery. Those attending have been asked to assemble at the Dunsford Funeral home at 1:45 pm. Pallbearers will be E C Minor; Seymour Drehmer; M R Young, Clarence Allen, H F Schmidt and Paul Russell. Kinsley Oct 27 � Vern Popp, former businessman and undersheriff here died today at his suburban home, where he had been ill ten days. He suffered an infection of a finger recently and went to Dodge City to have it examined. He had chills on the way home and developed pneumonia immediately. His condition had been critical for two to three days. Mr. Popp was the son of Mr. and Mrs. John Popp old time Kinsley business people and he was for many years associated with his father in a meat market after he returned here from service in the world war. In recent years he had lived on a suburban farm and served as undersheriff of the county until the beginning of the present administration. He was 39 years old. He is survived by his widow, former Miss Louise Burnett of Dodge City, two children, Vern Jr. and Betty Lou, his parents Mr. and Mrs. John Pope, a sister Mrs. Chester Bidleman of Kinsley. Mrs. Popp�s parents, Mr. and Mrs. Roy W. Burnett of Dodge City were called here before his death. Mrs. Mary Burnett, widow of the late H. A. Burnett died Sunday evening about six o�clock at St. Anthony�s hospital. She suffered a stroke of apoplexy Saturday. Funeral services were conducted Tuesday afternoon at the Presbyterian church at three o�clock by Dr. W. C. Templeton. Burial was at Maple Grove Cemetery. Pallbearers were old time friends of the Burnett family, namely H B Bell, Ed Snook, W F Rhinehart, John W Cady, S P Reynolds and George P Dugan. Mrs. Burnett first came to the southwest in 1884 with her husband. They located on a Gray County homestead. At the end of that year they moved to Medicine Lodge where they entered the mercantile business. In 1889 they returned to Dodge City to make their home. Mr. Burnett organized the First National Bank and being the first cashier of the settlement. A few years later he became the president of the bank serving in that capacity until his death nine years ago. Mrs. Burnett is survived by a daughter and son Mrs. Charles A. Kinkaid and Roy W. Burnett of Dodge City and a son Ralph H. Burnett of Kansas City; a brother John Webber of Indiana; and several grandsons and daughters. H A Kinkaid and Lucile Kinkaid, Dodge City; Mrs. Lillian Blackim, Wichita; Mrs. Louise Popp, Kinsley; Allen Burnett, Denver; Ewing Burnett, Coldwater; and Bob Burnett, Kansas City. Two great-grandchildren also survive her death. Lucille M. Kinkaid, 89, 200 Campus Apt 1B, died Monday June 14, 1993 at Western Plains Regional Hospital. Born July 21, 1903 in Dodge City, she was the daughter of Charles and Stella (Burnett) Kinkaid. She was born and raised in Dodge City and graduated from Dodge City High School and Washburn University in Topeka. She returned to Dodge City after college and taught at Lincoln Elementary for 46 years. She was a member of the First Presbyterian Church, Delta Kappa Gamma Sorority and the Retired Teachers Association all of Dodge City. Survivors include one nephew Charles Blackim, Salina. The funeral will be at 10 a.m. Thursday at Swaim Funeral Home, Dodge City with the Rev. Thomas M Church officiating. Burial will be at Maple Grove Cemetery. Friends may call from 9 am to 8 pm today at the funeral home. The family suggests memorials to the Dodge City Public Library in care of the funeral home. Roy Burnett, 77, formerly in the grocer business here for many years died Sunday at El Cerrito, Calif. Where he had made his home in recent years according to word received today. Mr. Burnett was the son of H A Burnett, Dodge City banker for many years. He was born January 12, 1878 at Raleigh, Ill. and came to Dodge City with his family. He was a member of the Masonic Lodge here. Before his retirement, Mr. Burnett operated a grocery store on Walnut Street. He was widely known in the community. He moved to California about 10 years ago. Death followed a long period of family health. Survivors are the widow; a son Allen Burnett, and a daughter Mrs. Louis Popp, both of whom live in California. Miss Louise Kinkaid and jack Kinkaid are his niece and nephew. Funeral services will be conducted by the Rev. James H Williams at 2 o�clock Thursday afternoon in the First Presbyterian Church. Burial will be at the Maple Grove Cemetery. H A (Jack) Kinkaid, 79, of Dodge City, died Saturday at Dodge City Regional Hospital. He was born October 27, 1900 at Medicine Lodge, the son of Mr. and Mrs. Charles Kinkaid. As a child, he came with his parents to the Dodge City area. He grew up here and was in the cattle business with his father on a ranch west of Dodge City, for many years and he continued to live on the ranch and operated the business after his father�s death. He moved into Dodge City in July. Survivors include two sisters Lucile Kinkaid and Mrs. Lillian Blackim of Dodge City. The funeral has been set for 10 am Monday at the Hulpien � Swain Funeral Home, Dodge city, with the Rev. Louis Dale officiating. Burial will be at the Maple Grove Cemetery. Nellie L Bottorff, 93, of Cumbernauld Village, Winfield died October 7, 2003 at William Newton Hospital. Family services will be at 10 am Friday at Highland Cemetery. Friends may call at Fisher, Taylor & Morris Funeral Home Thursday from 3 to 8 pm. The family will greet visitors from 6:30 � 7:30. Bottorff was born January 29, 1910 in Barber County to Carly (Fair) and Jesse L. Lemmon. She was raised and educated in Barber County and graduated from Sharon High School at the age of 16. She taught in rural schools until the fall of 1927 when she started attending Southwestern College. On March 30, 1930, she married Bernard Bottorff on her father�s ranch. They lived in Medicine Lodge where she was a homemaker and mother. In 1948 she returned to Southwestern to finish her teaching degree and began teaching at Medicine Lodge Elementary School. In 1952 she and her family moved to Winfield where she taught at Irving Elementary. In 1961 they moved to Topeka where she taught in the special education program in the Topeka public schools and completed her master�s degree in special education from Emporia State University. Bottorff was a member of the Grace United Methodist Church and had been active in the Medicine Lodge Order of the Eastern Star. Survivors include two sons, Bill Bottorff, Austin Texas and James L. Bottorff, Livermore, California; a daughter Patricia Dublin, Denver; five grandchildren and three great-grandchildren. A Rural Andover man is dead and his estranged wife seriously wounded as a result of a family argument Monday. Dead from a self-inflicted gunshot wound is David A Daublemont. Funeral services are pending. Null and Son Funeral Home in Rolla, Missouri are in charge. He was born August 27, 1933 in Edgar Springs, Missouri, the son of George Arthur and Zella (Weber) Daublemont. He served in the U S Navy during the Korean War and moved to Butler County in 1966 where he was employed as a carpenter. Survivors include two sons Vernon Alfred and Carl Andrew and a daughter Sharon Marie all of the home; three brothers Ed, Charles and John; a sister Alma and his father all of Rolla, Missouri.